Join us this weekend for more fun-filled afternoons of art-making. Our focus piece can be found in Gallery 102. It looks like a big wrinkled cloth from far away, but as you get closer you might be surprised by the material! Take a good look, and then make your way outside to Mi Casa, Your Casa to make necklaces inspired by this piece. Looking for something fun to do on the weekend? We’ll be here– Same place, same time. He has been a well-loved figure in everyday High life for years. His honest gaze and listening ears have comforted many. He is exceptionally well-read and has a keen appreciation for the art in our galleries. However the time has come to say farewell to an old friend. 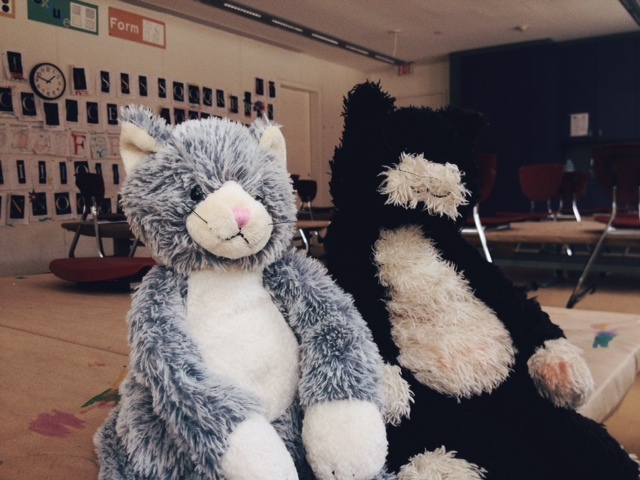 Ellsworth Kitty, our beloved education volunteer is retiring. He has been a familiar face at Toddler Thursday for many years and has never missed a story time. But, don’t fear, Toddlers, parents, and alumni! Ellsworth has been training his replacement and would like to introduce you all to his dear friend Alex Cats. No, he is not the famous contemporary painter whose works we collect in our gallery. He is, however, an exceedingly cuddly and clean grey kitty that loves kids, learning, and playing with yarn balls. We believe he will be a great fit here at the museum, even though he as big paw-prints to fill. So be sure to give Alex Cats a hearty hello and a nice hug to welcome him to life at the museum! 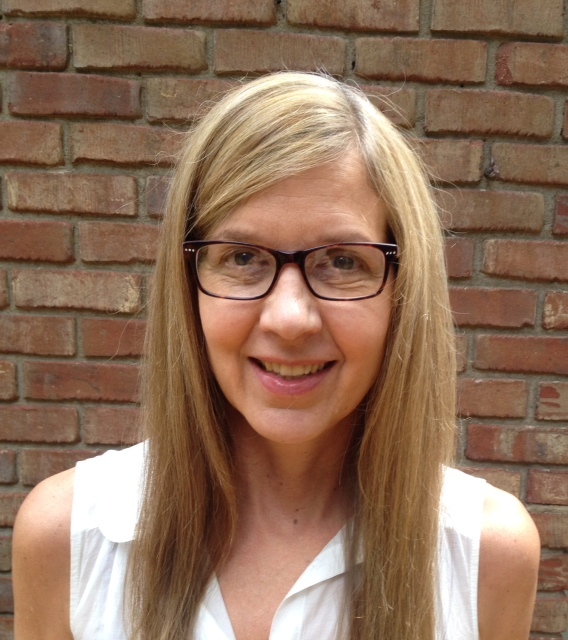 I am proud to introduce to you a V.I.P in our world of art education, Deirdra Alexander! She is on the front lines of our Toddler Thursday program and you can often find her working with various school programs and leading art-making workshops. She’s an absolute whiz in the world of exploring funky and fun art projects as well as being super kind, insightful, and dedicated. My first day working at the museum was during the opening of the new Renzo Piano expansion in 2005. It was a crazy and fun day with art making activities in the workshops downstairs, outside in the piazza, and even on the sidewalk on Peachtree Street. There were people everywhere. For our Toddler Thursday program I first walk through the museum and find a work of art to inspire an art making activity. I pick out a few points of interest from the work for an adult visitor to share with their young toddler, encouraging them to look deeper. I decide on a project using a variety of art mediums — paint, clay, stamping, collage, and even recycled objects. I then choose the book that will be read to the toddlers throughout the day. I also work with preschool, elementary, and middle school students who take a docent led tour through the museum and participate in an art making activity. I especially like working in the Afterschool Program which provides ten weeks of art enrichment learning for 3rd through 5th graders who attend designated Atlanta Public Schools. That I don’t even think of it as work. When I was in first grade, the teacher asked us to go home and think about what kind of job we would want to do all day long and every day… a daunting thought for a five year old. The only thing I could see never getting tired of was making collages. We had this great big tray of stuff the teacher would set before us and the possibilities seemed endless. So basically I do have my dream job! My favorite work to talk with students about is Untitled, by David Adamo. It is a tiny red door in our Contemporary Galleries. Young children amaze me with their detailed observations and curiosity about how to get inside the door and what could possibly be on the other side… pizza, a princess, all the candy in the world, even a family of elephants may be hiding behind that small red door. I also teach art at a local preschool. When I am at home I try to make some time for my own painting and also enjoy being outdoors. Otherwise I spend a lot of time reading and try to see an occasional foreign or art film. You know that drawer that you have in your house that has somehow accumulated years of paperclips, pen caps, broken rubber bands, and discarded bottle caps? You know the one. Instead of being ashamed, put it to good use! These seemingly worthless objects are the perfect materials for craft time with your munchkins. Spend an afternoon making “junk sculptures!” Use a piece of cardboard for the base, bust out the tacky glue, and watch your little ones build imaginative pieces of 3-D art! Some of our favorite pieces of art here at the High are made from found objects (things that others may have thrown away). 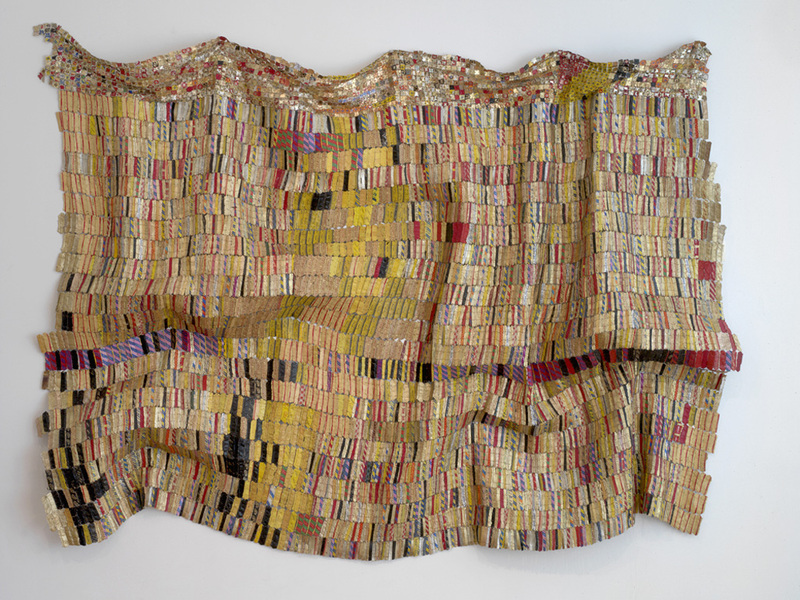 We have artworks made from chewing gum, bottle caps, broken mirrors, and cardboard. 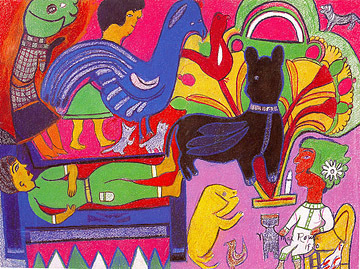 Bring your family to get inspired in our Folk Art collection where you will meet artists that were just average people using everyday objects to make extraordinary things. 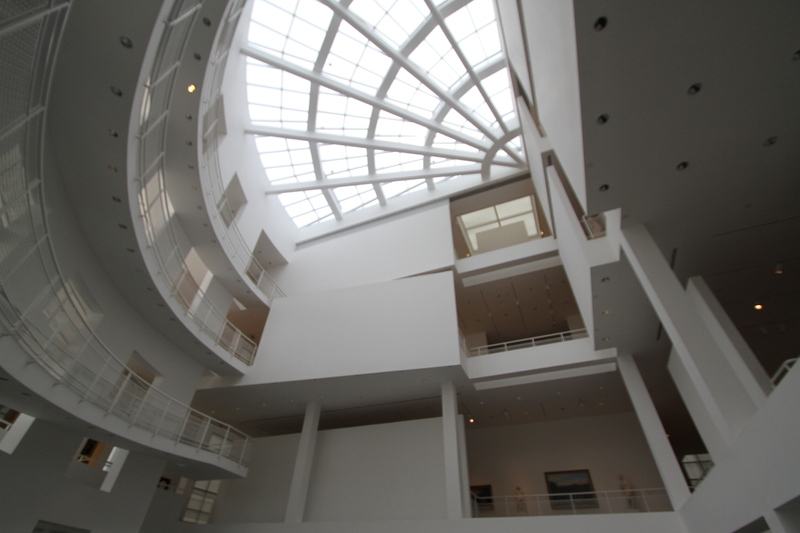 Richard Meier was the original architect of the High Museum of Art. Much of your adventure in the museum probably takes place in the Stent Family Wing, the part of the building that Meier designed. The circular ramps and wedge-shaped skylight in the atrium make us look up in wonder at the beautiful space. Sculptures peek around the pillars as we ascend the floors, inviting us into the galleries for a closer look. We aren’t the only ones who have fallen in love with his incredible design; in 1984, Meier was awarded the Pritsker Prize for his work on the High, the most distinguished architecture prize out there. When Meier’s kids used to ask him what his favorite color was, he always disappointed them by answering, “white.” He went on to explain to them that white wasn’t boring at all! In fact, white can be incredible because it is ever-changing, able to reflect all the colors of the rainbow! Meier had a favorite shape, too. Can you guess what it was? Next time you are at the museum go on a “square hunt” with your kiddos. They are everywhere if you take the time to notice! Next time you come to visit, head up to Gallery 304 on the 3rd Floor. You might find something lurking there that you haven’t noticed before. A certain piece of pottery may look unassuming from its back, but as you make your way to its front you will find yourself face-to-face with…well…A FACE! Pieces like this one appeared in South Carolina sometime in the mid 1800s. Their features provide an example of a creolized form that art historians believe has roots in both Africa and Europe. There is a small hole near the bottom edge of our Face Jug, making its use very mysterious. One theory suggests that adults kept things in them that they didn’t want their kids to get to and the scary face would keep the children away. This can be a fun piece to explore with your child. Get their imaginations going with questions like, “What do you think adults would put in these jugs? “ or “Can you make a face like these guys?” or “How do these make you feel? Curious, scared, silly?” You will surely get some creative answers! 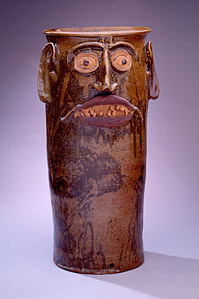 Face Jar can be found along with a few of his closest friends on the 3rd Floor of the Stent Family Wing in gallery 304.